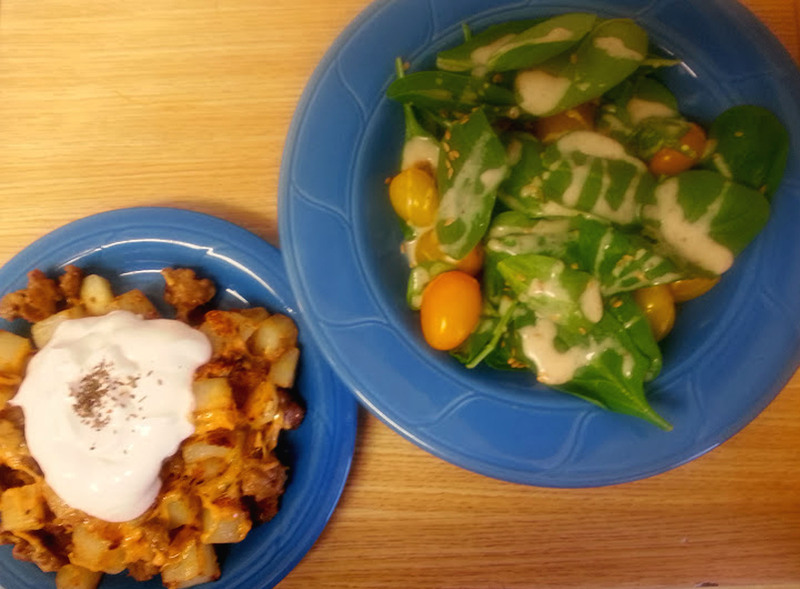 Indulge Lightly: Easy Cheesy Potato Bowl Ideas! Sometimes you just get those cravings you can’t avoid, and you probably shouldn’t if you don’t want to wind up pigging out on all kinds of other things that don’t even satisfy the initial craving. I was having one of these cravings yesterday. I wanted something “cheesy” (for me, that means the vegan version) and with a little spice to it. I took a peek in my fridge and found some ingredients to throw together. 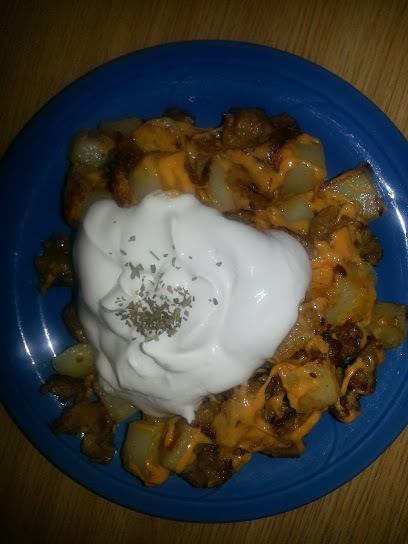 The result: a “cheesy” potato bowl with vegan sausage crumbles, and yummy sour cream to top it off with! I paired this with a spinach salad to get my veggies in. I also made sure to use a small bowl (in actuality I used a small plate) for my potato concoction so I didn’t overdo it on the serving. My craving was nipped in the bud and I didn’t feel guilty afterward…or like my pants needed to be unbuttoned. This is a vegan recipe that you can easily make “unvegan”, but I prefer you challenge yourself and give this Meatless Monday dish a try! I promise it’ll feel less heavy on your belly. I may have overdid it with the sour cream in my bowl just a bit. I got excited to dollop! *You can find this at most grocery stores. Of course, you can also choose to cut up potatoes and onions instead. I already had the Simply Potatoes in the refrigerator, so it was a no-brainer! Step 1: Heat up small frying pan with oil. Step 2: Crumble the sausage into the pan. Lite Life Sausage is mushy, so scrambling it up with a spatula may help. Cook till it starts to brown. Step 3: Add potatoes and onions to the pan. Stir. Step 4: Season with spices. Step 5: Once potatoes and sausage are browned to your liking, add Daiya Shreds and stir until melted. Step 6: Place mixture in a bowl or on a plate. Dollop with Sour Cream.